How do I book a group space in the Library? Group spaces can be booked in advance for use during self-service hours. Please confirm that your booking details are accurate as we cannot help with queries for group spaces during self-service periods. What group spaces are available for customers in the Library? Ground floor Learning Pods 1, 2 and 3 equipped with a PC and large flat screen - located on the ground floor of the Library behind the iZone. Pods 1 & 2 are bookable and Pod 3 is open access. 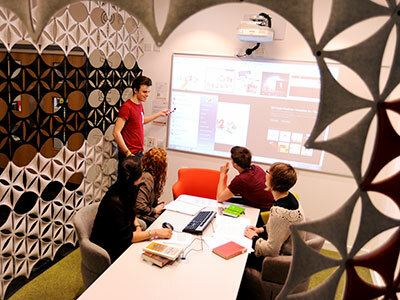 Ground floor The Hive - located behind the iZone, bookable and equipped with an interactive whiteboard and PC. Interactive whiteboard styluses for use in The Hive are available from the iZone on production of your TUSC during full service hours. These should be returned by 11:00 the following working day or fines of 50p per hour (max £6.00) thereafter will be applied. 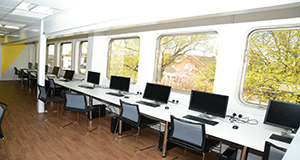 Floor 1 – Collaborate (CL1 – 6), 1 - 6 are equipped with a PC and large flat screen and can seat up to 4. Collaborate 1, 2 and 3 are bookable and Collaborate 4, 5 and 6 are open access. Bookings for space will be released after 15 minutes for non-attendance. How long can I book a group space for? The Hive, Learning Pods 1 & 2 (GF) and Collaborate 1-3 may be booked up to 7 days in advance for a maximum of 1 hour per week per customer. When you have finished using any group space please ensure that you leave it clean and tidy, remove any rubbish and return furniture back to its original position. Report any problems to staff in the iZone. To enquire about booking a University room or group space please email RoomBookingsCampusServices@tees.ac.uk or visit M2.08 in the Middlesbrough Tower. 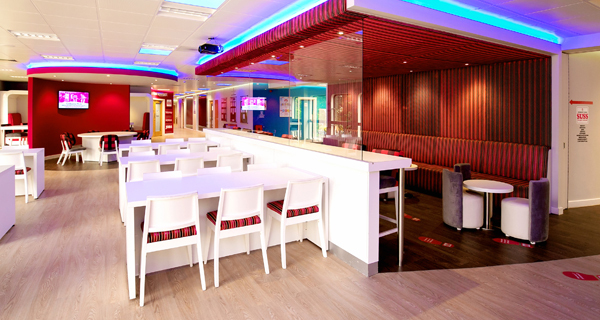 Looking for alternate study space - why not try the Students' Union Building? The Love It Lounge (1st floor, SU building) provides power points, a wide range of comfortable seating, plasma screens and easy connection to the Teesside University wireless network. The space is available to use during Students' Union Building opening hours. The space incorporates 2 meeting rooms (bookable through the SU Welcome Desk on the first floor) which include plasma screens and network/ power points. The SU Studio (2nd floor in the SU Building) includes 2 bookable meeting rooms, 10 computers, and a wide range of break out space. There is also a Snooze Room offering the ideal opportunity to get some brief respite from a busy day. The main SU Studio space is open from 9am to 9pm weekdays, you need to book meeting rooms or access to the snooze rooms through the SU Welcome Desk (1st floor, SU Building and open 9am to 5pm) and report there for access.